So now after I have finally grasped my life and got it semi-under control I can share with you guys details from my past travels.. 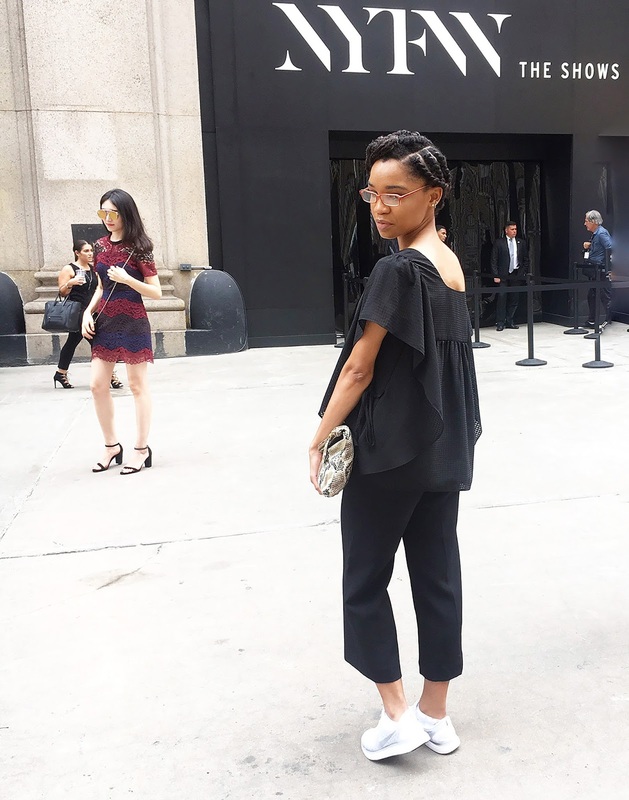 I WENT TO NEW YORK FASHION WEEK! 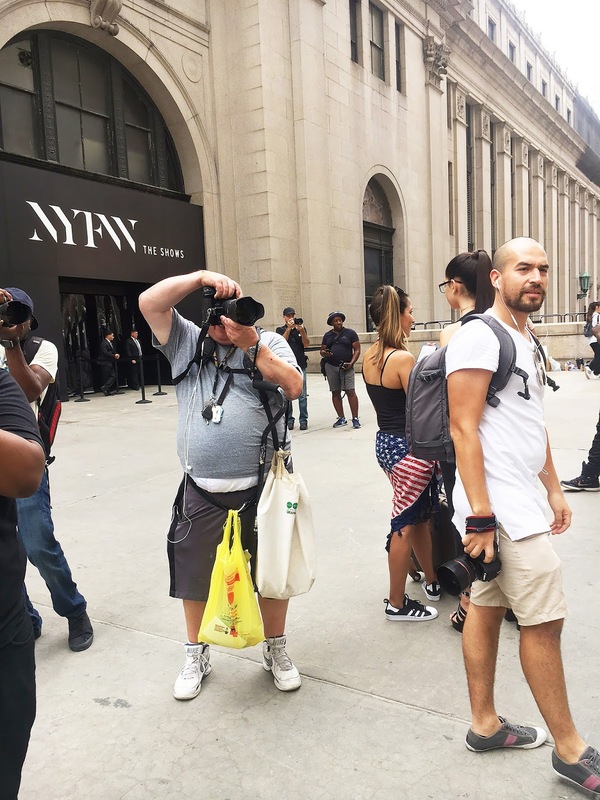 Almost every blogger (I can imagine) desires to go to #NYFW even if its just to be in the element and see what famous people might be walking by. I was fortunate enough to play both roles as a blogger by working back stage, seeing shows, and attending different events from time to time. I was also gifted a ticket to a fashion exhibit discussing the history of couture by Beverly Beal of lifeinbeverlyheels.com! Blogger to blogger I am sure she understands the amount of gratitude I have for receiving such a gift, especially at the last moment. Make sure you guys follow her on twitter @lifeinbevheels! When I was not working I went to take pictures in front of the iconic letters as the official stamp of approval for all of my work accomplished while I was in New York. While working backstage we were instructed to wear all black which wasn't anything I am not used to and my outfit came together with ease. Originally I was going to wear this flowy top with my wide leg chiffon pants, but it is still quite hot and muggy in New York and the heat of the subways is unforgiving. I went with my beloved culottes from Express that I have been wanting to style for you guys. These pants are so comfortable and perfectly cropped even on my 5'3 frame. I bought my shirt on an impulse (typical millennial) from Target's Who What Wear collection. I loved the free-flowing style and movement it provided in contrast with my structured pants. Last but not least, my shoe choice: sneakers. You guys know I love to stay comfortable no matter what and heels were NOT my go to when it came to running around backstage and the city. My all white Free Run Distance sneakers from Nike are the true white (not that dingy off yellow color that sneakers tend to be sometimes) and they added a nice pop with out being too casual. I am sure my Instagram (Genuinely_AA) caption read something like "Sneakers should be the new heels.." no but really, my feet were comfortable all day long and I got endless compliments on the black and white combination! 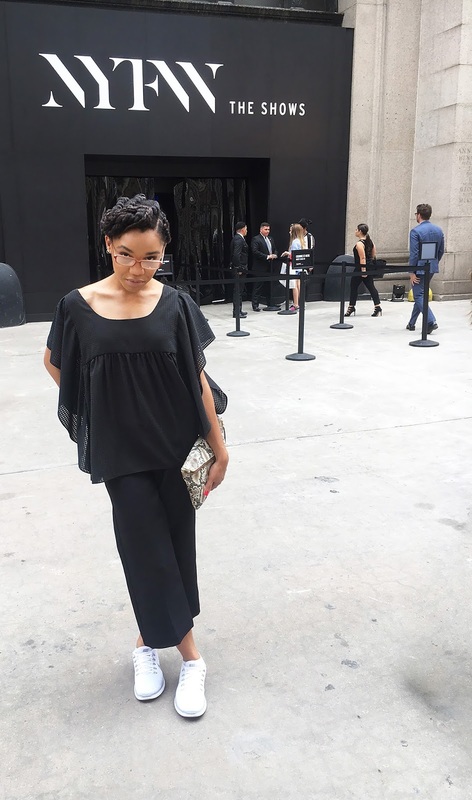 I am definitely going to go into my experience in more details so keep an eye out for 10 Tips to Survive your first #NYFW and another post on a few ways to gain access to the biggest fashion event every year! Last year it was a dream of mine to attend and do something I never done before, travel by myself. This was obviously before I knew my best friend would move to Boston and I would venture into New England on unplanned adventures, but #NYFW has always been in my heart, especially these past 365 days. When I found out I was selected to volunteer and work with StyleFW and also gained tickets to an event at the same time I was overjoyed and grateful. God has been so good to me this 2016 and I have gotten seemingly everything that I wanted. I just want to say to all of you guys wanting to go that you can do it, but you need to start now! Start reaching out and working with different brands, start putting yourself out there and get in and uncomfortable place because that is when greatness happens. All of the other veteran bloggers at #NYFW were in your shoes once we all have our first time at something so don't feel alone or like you aren't good enough. With faith anything is possible! I am hoping to seeing and meeting some of you next season! Also thanks to the RIRI Crush girls that gave me a free sample and also a super cute cosmetic bag (like I need anymore)! Make sure you guys check out her new fragrance, I absolutely love it might have to look into getting the full sized product! Don't forget to follow me on Instagram: Genuinely_AA! ahhh! you are so lucky to have attended NYFW! Do you live in NY or work in the fashion industry already? I hope one day I will be able to make it happen. I always watch everyone go this time of year and it looks amazing. It was so amazing! I agree I am very blessed indeed it was such a great experience! Stay tuned for my 10 tips on How to Survive your First NYFW as a Blogger it should be up by tomorrow! I live in NC and I am still a student actually lol so it was a travel experience for me. I volunteered and got to watch shows so I was backstage helping designers and what not. There are volunteer opportunities all the time, you should look into it! I absolutely adore the crisp white sneakers and all black outfit combo. Clean and simple, and comfie! I would give anything to attend NYFW one day. I'll get there eventually. You definitely will get there! I actually volunteered through a company called StyleFW! We worked with different designers back stage and I was also able to attend events and see shows it was super fun! 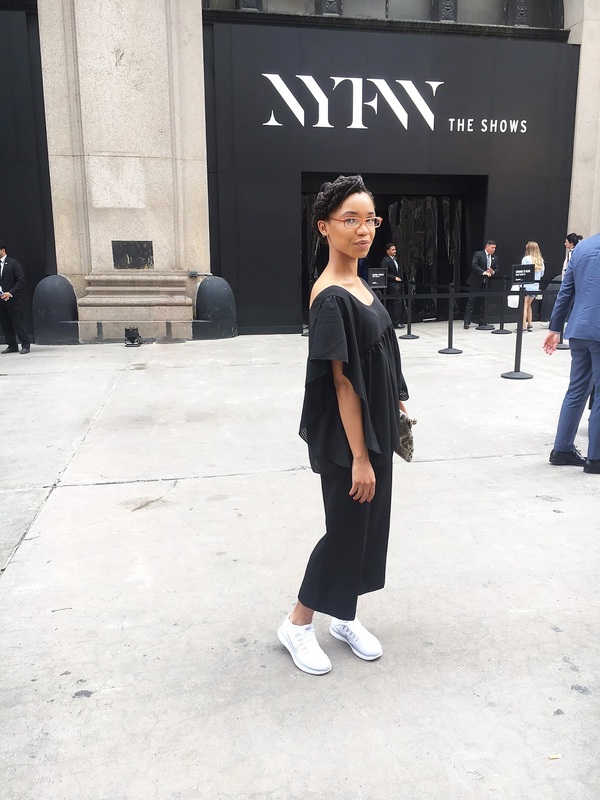 I love sneakers and love being comfortable, I talk about this in my 15 Tips for Surviving Fashion Week post! I'd rather be comfortable than my feet killing me trying to navigate the city lol. I am just happy the look came together. Looks like you had tons of fun! Hopefully I will make it there one day! You definitely can! I had so much fun but it was also quite exhausting being on the go, but I definitely loved it!